Deanna Cantrell, San Luis Obispo’s new police chief, begins work in SLO on Monday. Cantrell, 45, was a member of the Mesa, Arizona police department for 21 year. She most recently served as assistance police chief and was in charge of the department’s administrative services bureau. 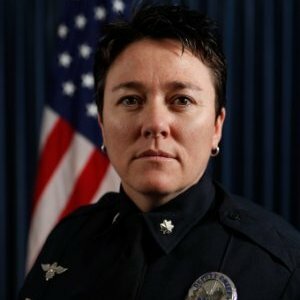 City Manager Katie Lichtig hired Cantrell, choosing her over both of San Luis Obispo’s current police captains. Captains Chris Staley and Keith Storton had been rotating as acting chief since Lichtig parted ways with then-chief Steve Gesell in May. Cantrell said in an interview with the Tribune that she is a scholar of the U.S. Constitution and passionate about protecting people’s constitutional rights. She also said she loves the use of police body cameras. In Mesa, a 70 percent decline in officer use-of-force incidents occurred after the police department equipped officers with body cameras. Also, a 49 percent drop in citizen complaints occurred, Cantrell said. SLOPD is implementing a body camera pilot program. The police department intends to equip all patrol officers with body cameras by the end of 2017. Cantrell said she plans to keep in place two elements of the police department that Gesell put in place — the Community Action Team and the chief’s roundtable. The Community Action Team consists of two officers who pay close attention to local homeless individuals who are chronic low-level offenders. The chief’s roundtable is a group of community members who volunteer to meet with the chief quarterly. Cantrell is scheduled to be officially sworn in as police chief at the Jan. 19 city council meeting. Is Gavin Newsom trying to close Diablo Canyon? Did anyone else want the promotion, or was that just not an option? You bring in someone from outside the community that is beholden to YOU and then you control them. Two other people, both long-time SLOPD officers with years of experience, also put in for the job. There is a possibility that this new person was NOT the high scorer on a written test for the position. There is a possibility that Katie Lichtig chose this new chief over the local person who scored higher on the written test. There is a possibility that this is a deliberate “F**k You” on Katie Lichtig’s part to the SLOPD who’ve resisted her power plays in contract negotiations. Now, understand me. Cantrell may very well be a terrific person and a great cop; I will give her the benefit of the doubt. However, given Lichtig’s propensity to conduct Stalinist purges of any department head who evinces a hint of independence, the locals in the know think that this is another instance of Katie Lichtig using her power to reorder San Luis Obispo to her own liking. Cantrell now comes into a department that is resentful over one of their own, who was better qualified, being passed over for the job; Lichtig has done her no favor and continues to use and discard other human beings for her own political and professional ends. Lichtig and crew all looks the same. Maneaters. Women power. Down with men. Be nice and maybe you’ll get invited to the hot tub party. Splendid!, Welcome, we are very glad to have you in our area. We need more women at the top of our law enforcement. I didn’t know Katie Lichtig had a twin. They probably share the same (((interests))). Just think if Gavin becomes Gov. we may have to change colors in our state flag. Now Lichtig owns the City Counsel AND Police Chief. Nothing to see here folks….just move along as the City Counsel lets the inmates run the brothel. Blame it on the voters, they gave the city it’s new tax and now that the council is flush with money they are doing anything they want, but the voters are the ones that allow them by continuing to vote them into office. That would certainly be in support of our Constitutional rights, but contrary to the liberal agenda that she would have to align herself with to stay in Lichtig’s/Marx’s good graces. Even if she wanted to do the right thing, her hands would be tied. And not with the Police Chief under her thumb….bingo…. Looks like she could be friends with you chief in MB. Could lead to a real cat fight. Neither does the new police chief apparently.